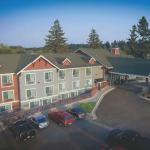 Offering free Wi-Fi complimentary breakfast and sumptuous beds the non-smoking La Quinta Inn & Suites Kalispell is one of the most popular hotels in the area among our guests. Equipped with the stuff dreams are made of the 71 rooms at this three-floor modern-rustic lodge are outfitted with top-of-the-line Euro-top mattresses wrapped in crisp white linens. Other in-room comforts include free Wi-Fi premium cable TV mini-fridges and microwaves. How sweet it is that guests start their day with a complimentary breakfast buffet and end it with freshly baked complimentary cookies. Whether up for a dip or a cardio spin guests have access to an indoor pool hot tub and fitness room 24 hours a day. Pets are welcome and parking is free. Right off Highway 2 the hotel puts guests as close as a five-minute walk to retail stores restaurant chains and casino action. For slower-paced charm historic downtown Kalispell â?? an ideal spot for antiquing and mom-and-pop shop shopping â?? is a one-mile drive. Those anxious to break out the clubs fear not: the area's many courses include Buffalo Hill Golf Club three miles away. Boaters hikers and anglers looking for a reel good time should head for Flathead Lake a 25-minute scenic ride. Glacier Park International Airport is seven miles from the hotel.